I met Amy Ware on the pool deck before a Master’s swim practice about six months ago. “Half?” I asked, referring to the 70.3 distance some of my friends had on their schedule. I nodded. I’ve never done an Ironman distance triathlon, but I am married to someone who has, and I know the training is grueling. It’s at least a part-time job, sometimes demanding more than 20 hours of training a week. It’s not for the faint of heart. We got into the water and did our workout, and soon I’m following Amy on Strava. Then I’m riding with her and running with her (me working hard to keep up, mind you) after swim practices. Then we are carpooling to a race. Then she’s coming to my Active Recovery class. And then, just about two weeks ago, she not only finishes the full Vineman, she kills it. Amy is inspiring. Here’s a little more about her journey and how yoga works into her life as a triathlete, nurse and partner. When did you start doing yoga and why? I started doing yoga after a knee injury side lined me from running in 2010. I started with Bikram yoga, as I was mostly interested in the “workout” aspect of the experience, so I attended class 2 to 3 times a week to “keep up my fitness” while I was unable to run. As it turns out, I enjoyed the other aspects of yoga too, so have added vinyasa and restorative yoga to my schedule. 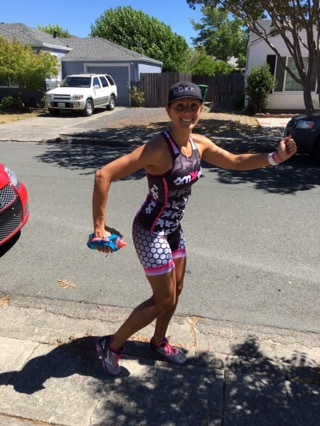 Amy with lots of energy left and a big smile on the run at Ironman Vineman 2016. How do you yoga has affected your triathlon training? Yoga has been super helpful! I try to integrate it into active recovery days after hard training sessions for the stretching benefit and to change the way I’m working my body. What’s your favorite thing about yoga? I love that it challenges me in entirely different ways. I work different parts of myself and bring awareness to what I’ve got going on, and where I’ve got strength and weakness and what’s hurting or feeling really good. What would you tell your athlete friends about why they should do yoga? Yoga is an amazing addition to a training program of any distance! It helps strengthen both mental and physical elements and it has helped me bring awareness to what’s going on inside and outside of myself. Plus, who doesn’t need an hour or two of dedicated stretching a week in their training?!? Yoga is a perfect complement to the craziness that is Ironman training! Haha! Good question! I’ll be doing the 70.3 in Palm Springs in December, but I technically don’t have another long course on the schedule… yet…. Posted in Benefits of Yoga, Inspirational, Yogi Spotlight and tagged Benefits of Yoga, Crosstraining, Ironman, strength, Training, Triathlete, Yogi. Bookmark the permalink.